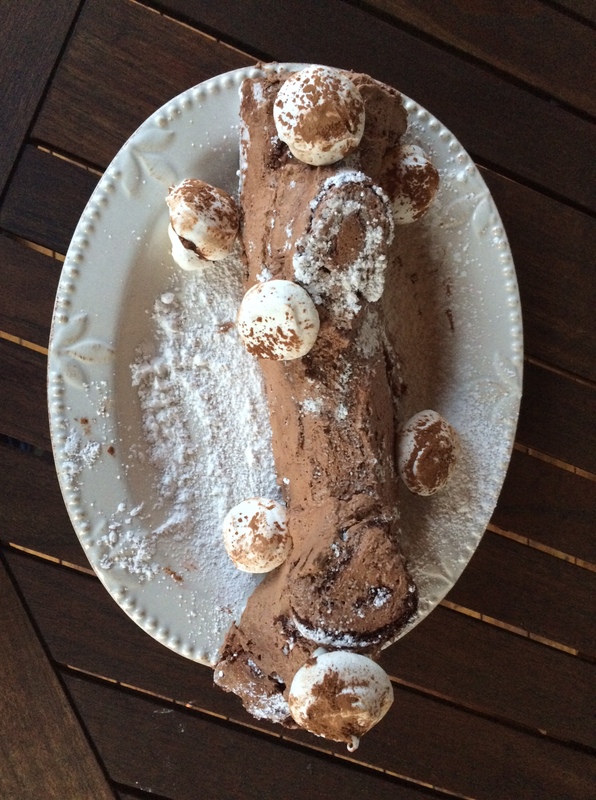 Here’s another thing: It’s always called a Yule Log, not a “Buche de Noel.” I think we just like saying yule log in our family… None of us have very decent french accents! We also have never really cared about getting all fancy with the decorating – if you read this blog you know I’m not the most skilled cake or cookie decorator, and for us, taste ALWAYS comes first. 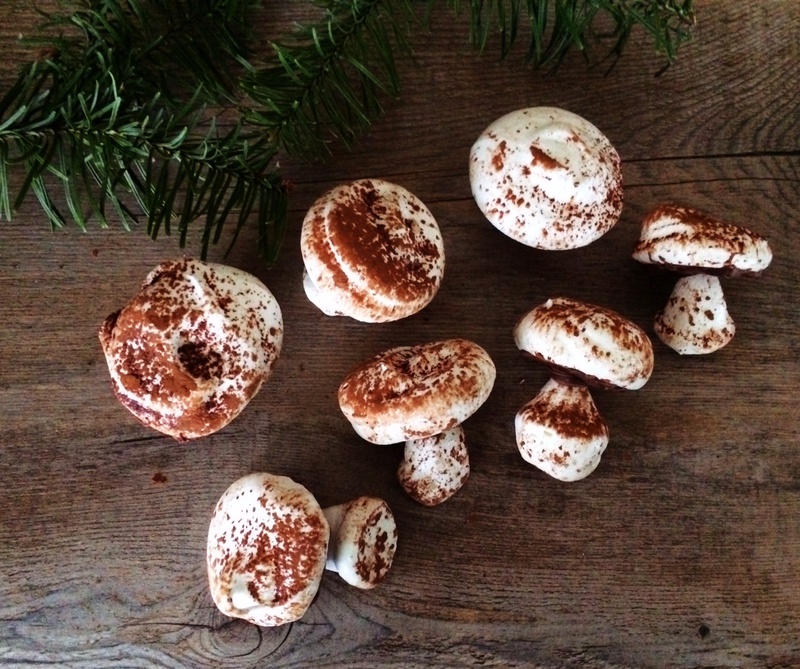 However, we did realize mushroom meringues were a nice, tasty touch, and could easily be made a few days ahead. 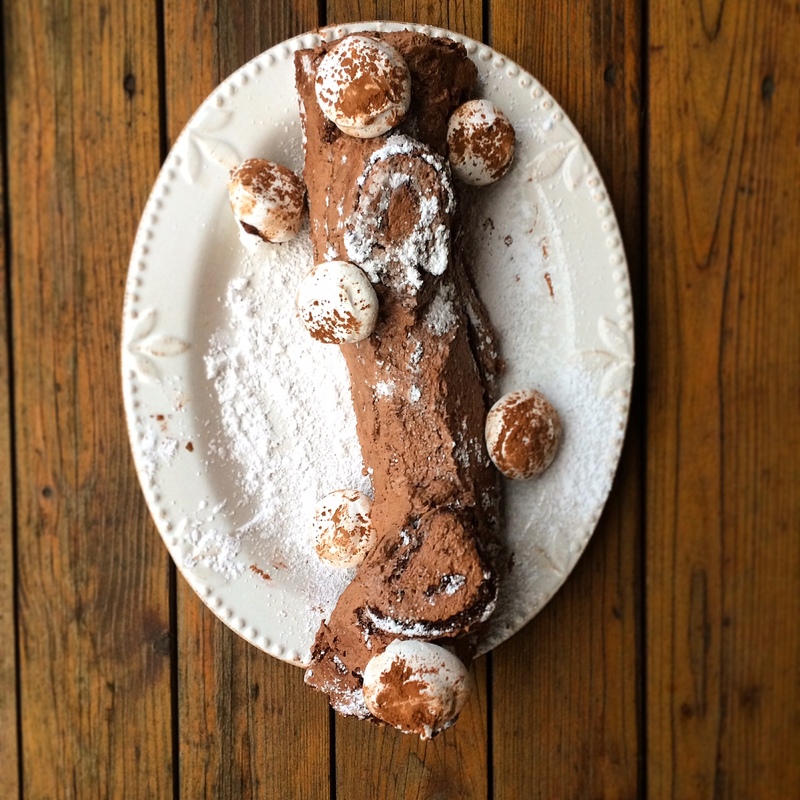 This cake recipe has withstood the test of time over the years, we have tried other ones that fall apart and kind of ruin your day…putting together a Yule log is tricky enough as it is, and you need to make sure your cake won’t fall apart when you are doing the rolling! 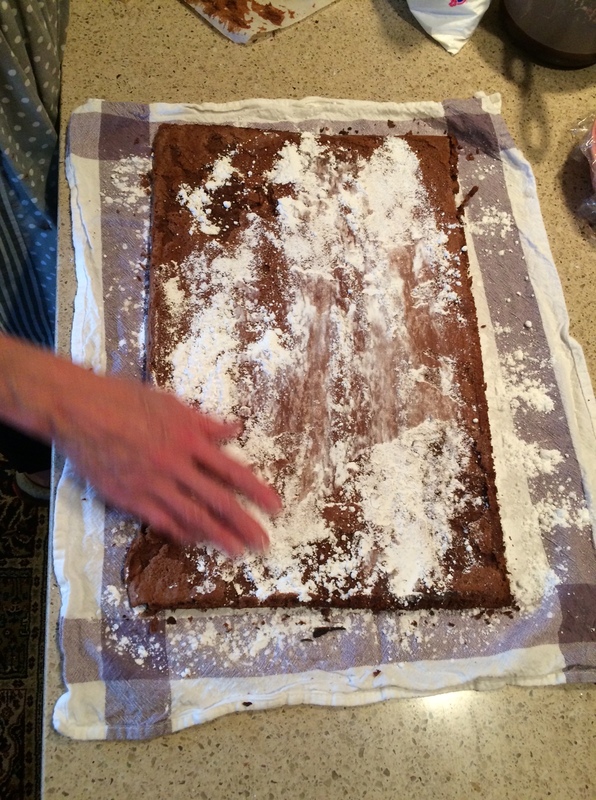 We find it works best to sprinkle powdered sugar on a clean kitchen towel and turn the cake out onto it. Sprinkle powdered sugar on the other side of the cake, then roll it up into the towel so it will set and not crack when you roll it up with the filling. 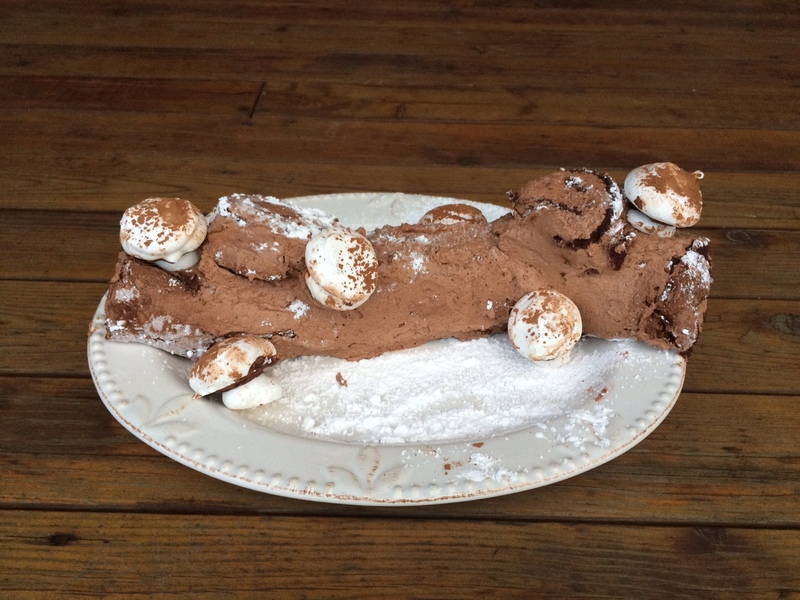 Yule logs only come around once a year, and I hope to share our many renditions with you over time! Preheat the oven to 200 degrees Fahrenheit. Line a large baking sheet with parchment paper. In a bowl of an electric mixer, beat the egg whites and salt until foamy. Add the cream of tartar and beat until soft peaks form. Gradually, about 1 tablespoon at a time, add teh sugar, beating for 15 minutes, or until stiff, glossy peaks form, adding in the vanilla halfway through. Fill a pastry bag fitted with a plain 1/2 inch tip with the meringue and pipe 18 rounds, about the size of a quarter, onto the parchment paper at one end of the baking sheet. This will be for the mushroom caps. To make the stems, hold the pastry bag upright (perpendicular to the paper) and about an inch above the paper. Squeeze out meringue as you pull up on the pastry bag until the meringue is about 2 inches tall, making it slightly wider at the base. Place the cocoa in a small sieve and sprinkle it over the meringue. Bake for 1 hour and 30 minutes, or until the meringues are crispy and set. Let cool on the baking sheet, then lift off the parchment. 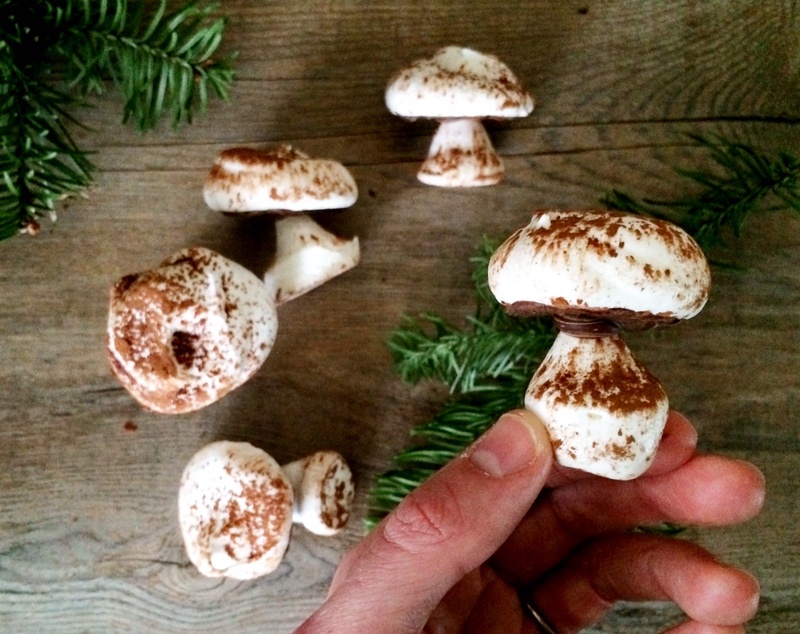 With a small icing spatula, spread the flat side of the mushroom caps with the melted chocolate and then “glue” the stems to the caps by pressing the flat side of the stems to the chocolate side of the caps. Store in an airtight container for up to several weeks. Preheat oven to 375 degree F. Line a 10×15 inch jellyroll pan with parchment paper. In a large bowl, use an electric mixer to beat egg yolks with 1/2 cup sugar until thick and pale. Blend in 1/3 cup cocoa, 1 1/2 teaspoons vanilla, and salt. In a large glass bowl, using clean beater, whip egg whites to soft peaks. Gradually add 1/4 cup sugar, and beat until whites form stiff peaks. Immediately fold the white mixture into the yolk mixture. Spread the batter evenly into the prepared pan. Bake for 12 to 15 minutes in the preheated oven, or until the cake springs back when lightly touched. Dust a clean dishtowel with powdered sugar. Run a knife around the edge of the pan, and turn the warm cake out onto the towel. Remove and discard parchment paper. Starting at the short edge of the cake, roll the cake up with the towel. Cool for 30 minutes. In a large bowl, whip cream, 1/2 cup powdered sugar, 1/2 cup cocoa, and 1 teaspoon vanilla until thick and stiff. Refrigerate. Heat the orange zest, juice and sugar in a saucepan until the sugar has dissolved. Add all the cherries and cook for about 5 minutes until they have softened. Turn off the heat and add 2 good splashes of kirsch or brandy. Allow to cool, then strain through a sieve, reserving the syrup. Unroll the cake and brush it with the cherry syrup. Spread the cake evenly with a layer of the whipped chocolate filling, spreading within 1 inch of the edge. You will want to make sure there is extra filling the frost the log with. Follow with a sprinkle of the cherry filling on top. Roll the cake up with the filling inside. Place seam side down onto a serving plate, and refrigerate for about an hour to chill and set. 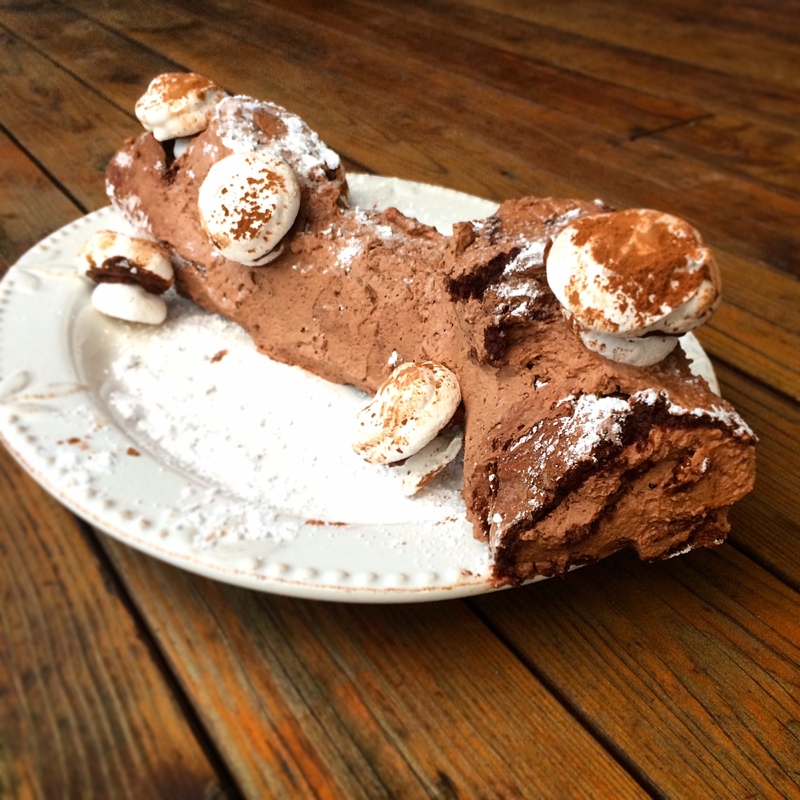 When ready to serve, spread the rest of the whipped chocolate over the cake, feel free to keep the spreading rustic for a good ole’ yule log look. 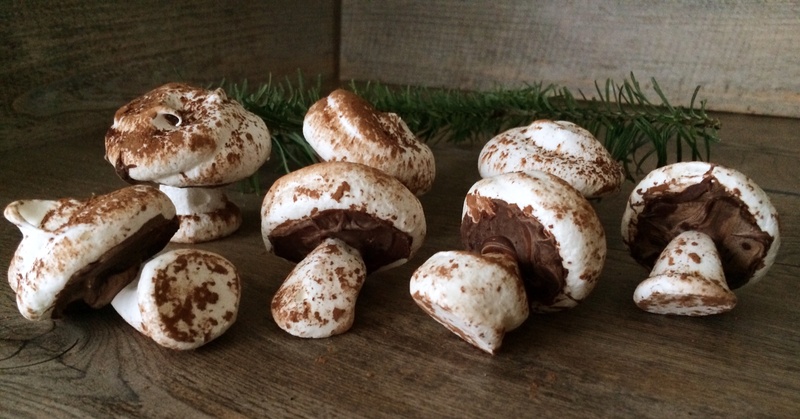 Decorate the yule log with your mushrooms meringues.